A Life of Sugar and Spice: Clean Eating Mag, Gluten, Acne, and 5 Pounds. 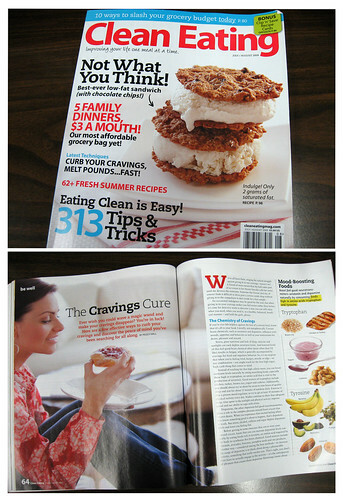 There is a great article in the current issue of Clean Eating magazine about cravings and serotonin and dopamine levels. It talks about bad habits that we create and the way they trigger cravings, like for example when you automatically grab a candy bar at the checkout each time you go to the grocery store, and how to break those habits. It's funny how I won't even be hungry but just the thought of eating a cookie, and that feel good response I get from that cookie, will make me into a raving lunatic until I get that cookie! Sadly, I've gained, rather than lost weight in the past few months. I also am having some serious skin issues. I haven't had this much trouble with my skin in a long time, which makes me wonder, is re-introducing gluten into my diet causing my skin to react? It's possible I suppose. Because I haven't really changed any other habits, and actually, other than eating a lot more gluten, I've been eating good stuff. Well, mostly. Eating gluten has been awesome, I'm not going to lie, but I've had this nagging voice in my head that keeps telling me I'm better off without it. It's really hard to tell because my meds are working so very well. My stomach is in good shape. Yes I wanted to go gluten and dairy free so that eventually I could come off the meds but the doctors have me convinced that that will never be an option. (or will it???) Argh! So confusing. And despite the fact that I'm eating gluten, I still find myself in the gluten free section at Stop & Shop and do you know what I found there??? A ton of Kinnikinnick foods!!! They are now stocking it regularly!!!! I was so excited. Well, the bottom line is, I still don't know if this is going to be a gluten-free life or not. I'm thinking I just might give it another go and see what happens. If my skin clears up by the end of the week, I'll definitely have my answer. Wait, did I say the end of the week? That means this experiment starts... tomorrow!!! Oh boy, here we go again!!! ETA: I also noticed in the last couple of weeks that my bruising problem has come back. For a while last year the bruising went away but just recently I all of a sudden started getting mysterious bruises again without any recollection of bumping myself. I have always had this problem but over the past year when I was pretty strict on the GF diet it had gone away. I never linked it to that until this past week when I noticed it coming back, plus the acne. Any thoughts? I also have had intermittent skin issues that, while going off of gluten helped, have been pretty persistent. But that type of thing has so many possible causes it's almost not worth trying to figure it out. I had seasonal allergy testing done for the first time last week, and was somewhat humbled by the number and severity of the allergies I have to things I'll never be able to avoid -- trees, weeds, etc. I had my first shot today, and developed a small itchy spot at one of the injection sites. The first shot is something like 20 parts per 100 million of the allergens -- practically nothing. But my immune system picked it up nonetheless, which is both impressive and depressing -- short of living in space it seems complete avoidance of allergens isn't really an option -- just put some hydrocortizone on it and go have a donut. We celiacs won't judge you. Sugar & Spice & My Raging Lymphocytes? put some hydrocortizone on it and go have a donut hahahahaha that's awesome. your body may just be adjusting to your diet, I might give it a little more time? THEN try like 3 or 4 weeks gluten free (with NO cheating) and see how you feel then? You're right Allie, I think I'm just going to focus on eating healthier in general, not worry about gf too much yet and give it some time. Then if I feel I need to I'll try going GF again.